Charles Antoine Coysevox (29 September 1640 – 10 October 1720), was a French sculptor in the Baroque and Style Louis XIV, best known for his sculpture decorating the gardens and Palace of Versailles and his portrait busts. The name is pronounced quazevo. Coysevox came to Paris in 1657 and joined the workshop of the sculptor Louis Lerambert He trained himself further by making copies in marble of Roman sculptures, including a Venus de Medici and the Castor and Pollux. In 1666, he married Marguerite Quillerier, Lerambert's niece, who died a year after the marriage. In 1679 he married Claude Bourdict. In 1667 he was commissioned by the bishop of Strasbourg, Cardinal Fürstenberg, to statuary for his château at Saverne (Zabern). Coysevox rose steadily in the artistic hierarchy. He became a professor at the Royal Academy in 1678, and then its director in 1702, with an annual pension of four thousand livres. In this position, he guided the training of a generation of French sculptors, including his nephews Nicolas Coustou (1659-1733) and Guillaume Coustou (1677-1746), who became important figures French sculpture of the early 18th century. Coysevox died in Paris on 10 October 1720. He executed Justice and Force and the River Garonne at Versailles. 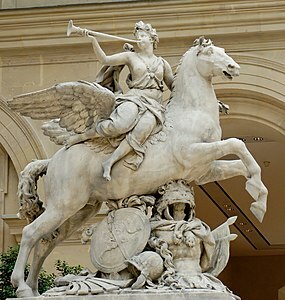 Among his works from Marly are the Mercury and the equestrian Fame (1702) and four groups commissioned for the "river" in the château's park; La Seine and its pendant at the head of the cascade, La Marne, Neptune and Amphitrite. Models in weather-resistant stucco were set up in 1699, replaced by marbles when they were finished in 1705. The groups were seized as biens nationaux in 1796 and dispersed: the Seine and Marne went to Saint-Cloud, and the Neptune and Amphitrite went to Brest in 1801. Besides the works given above, he carved about a dozen funeral monuments, including those to Colbert (at Saint-Eustache), to Cardinal Mazarin (in the Louvre), and to the painter Le Brun (in the church of Saint Nicolas-du-Chardonnet). Between 1708 and 1710 Coysevox produced three further sculptures for Marly, a Pan (now in the Louvre), flanked by a Flora and a Dryad (in the Tuileries Gardens). A highly finished terracotta bozzetto or reduction of the Dryad, signed and dated 1709, is in the Ashmolean Museum, Oxford. For the facade of the dome of the royal chapel of Les Invalides, he sculpted a bust of Charlemagne, a pendant to the statue of Louis XI by another royal sculptor, Nicolas Coustou. On the upper level of the same chapel he made a group of statues illustrating The Cardinal Virtues. Coysevox sculpted portrait busts of many of the celebrated men and women of his age. The faces of his busts were considered remarkably accurate; he did not flatter his subjects, but by the poses, detail and precision of the costumes he gave them a particular dignity. His subjects included Louis XIV and Louis XV, at Versailles; Colbert (the kneeling figure of his tomb at Saint-Eustache); Cardinal Mazarin, (in the church of the Collège des Quatre-Nations); [[Louis II de Bourbon; Louis, Grand Condé (in the Louvre); Maria Theresa of Austria; Henri de La Tour d'Auvergne, Viscount of Turenne; Vauban; the Cardinal de Bouillon; and de Polignac; the duc de Chaulnes (National Gallery of Art, Washington); Fénelon; Racine; André Le Nôtre (church of St-Roch); Bossuet (in the Louvre); the comte d'Harcourt; William Egon Cardinal Fürstenberg; and as Charles Le Brun (in the Louvre). ^ a b Geese, 2015 & pg. 309. One or more of the preceding sentences incorporates text from a publication now in the public domain: Chisholm, Hugh, ed. (1911). "Coysevox, Charles Antoine" . Encyclopædia Britannica. 7 (11th ed.). Cambridge University Press. pp. 355–356. ^ Geese & (2015), p. 309. ^ a b Geese (2015), p. 309. ^ J. Byam Shaw and Ian Robertson, "Sir Karl Parker and the Ashmolean" The Burlington Magazine 104 No. 715 (October 1962), p 429 (illus. ), 432. ^ Geese 2015, p. 310. L. Benoist, Coysevox (Paris: Séries Les Maîtres de l'art) 1930. François Souchal; Françoise de La Mourèyre; Henriette Dumuis, French Sculptors of the 17th and 18th Centuries, the Reign of Louis XIV, Catalogue A-F (Oxford: Bruno Cassirer) 1977. Contains the latest, revised biography and list of works. Wikimedia Commons has media related to Antoine Coysevox.